Aino-Maija Metsola is an illustrator and print designer based in Helsinki, Finland. She currently work as an invited in-house designer at Marimekko, but she has designed prints for the Finnish brand’s clothes and interior textiles as a freelance designer since 2006. She created the superb pattern shown in the banner above, as well as the one used for the launch of Marimekko’s flagship store on 5th Avenue, NYC. I have been making pictures ever since I can remember. I chose to study graphic design at the University of Art and Design Helsinki (currently called as Aalto University), probably mostly because when I was 18 years old it seemed like the sensible thing to do instead of aiming to be an artist. I started to do freelance work, mostly graphic design, during my studies. After starting to work for Marimekko I gradually drifted to be an illustrator and a print designer. You can view her work here. 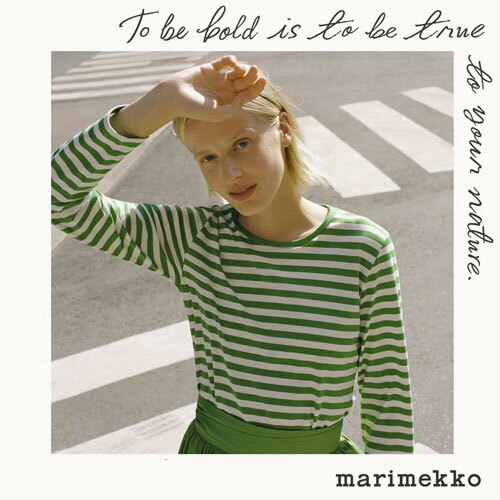 How did your collaboration with Marimekko started? I ended up designing prints almost by accident. I took part in a design competition organized by Marimekko in 2005. The company liked my print Mökki that I sent in and took it in their interior collection. I noticed that designing for Marimekko was something I really liked and wanted to concentrate on that together with illustration. What do you like most about your work at Marimekko? I really love that it’s hands-on work. I draw, cut and paint by hand. When my print goes to production I can usually see the whole process in front of my eyes in Herttoniemi, Helsinki which is great. I can’t say so much about the things that I’m doing right now except that I’m working on some things for Marimekko’s autumn 2014 collection and together with a few other Marimekko designers I’m taking part in a very interesting project that is outside my normal field of work. I’m aiming to do things that are strong and delicate at the same time. With good colors. But I like to experiment so I wouldn’t like my style to be too stable. You need to stay open-minded. It’s challenging but great. If I try to define myself in three words I would most certainly be lying, I think I don’t know myself well enough. I hope I can’t be simplified to three words. All things around me, it’s difficult to be more specific. This time of the year is always very inspiring when you start to see, feel and hear signs of life again after the long winter. Colours are very important to me, so I pay attention to colors everywhere I go. Inspiration depends on the mood, on some days I can see inspiring things everywhere I look. Also very often the drawing and painting process in itself is very inspiring. Long walks alone and clean table space makes my mind work. My dachshund Turo, he doesn’t need much, he is so good at living in the moment and concentrating in the essential things in life. I also admire people who really put their heart into what they do and you can see that in their work. Best design piece/art you purchased? An old Yrö Kukkapuro’s Ateljee sofa and armchairs from the 60’s. Where do you like to shop for your home? I don’t shop much for my home, I’m not so interested in collecting a lot of things. The latest thing I got was a traditional woven striped fabric from Tallinn, we use it as a bedspread. Most of the furniture at my home is made by my husband and I like to sew, knit and make ceramics, so I don’t need to shop much. Except for the materials. Some seeds, herbs and flowers to plant. We have had a small kitchen garden for a few years. For some reason I haven’t been so inspired by it this spring but I’m now trying to activate myself. I guess it’s just love and hope. I really don’t want to know and I don’t think about it much. I think I’m not a career planning person. I hope I’m alive and happy in five years.